New Formula (less Niacin) and Lower Price! 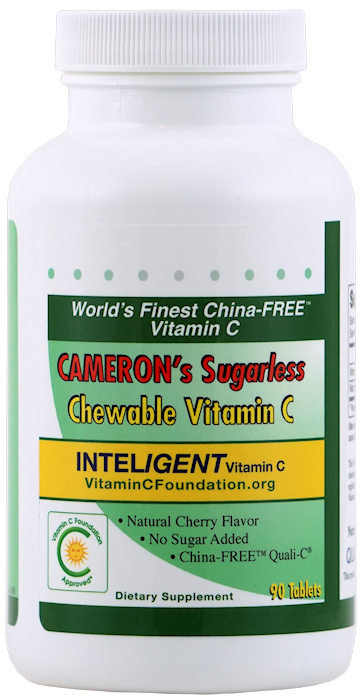 Pleasant tasting Cameron's Chewables™ contain only China-FREE Vitamin C, (sodium ascorbate and ascorbic acid), with non-flush Niacin (Vitamin B3). The natural Cherry Flavor is augmented with the sugar substitutes (sorbitol and xylitol). No sucrose or glucose: Safe for diabetics. 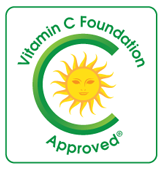 These unique sugarless vitamin C chewables are designed for all-day use, e.g. by cancer patients wanting to keep their redox levels high. Alternatively, they can be used once or twice per day for your kids. The pleasant candy-like taste will make your children want to take their vitamin C.
Other active ingredients are xylitol, sorbitol, and cherry flavoring for taste.